Jeen and I made a list of all the food places we wanted to visit before she heads back to Sydney. Dragon-i was one of them so off we went with rif and Tgin. I ordered the Szechuan La Mien while rif had the Hot and Sour La Mien. Jeen and Tgin had the La Mien with Dumplings and Beef Brisket La Mien respectively. My Szechuan La Mien was rather good. 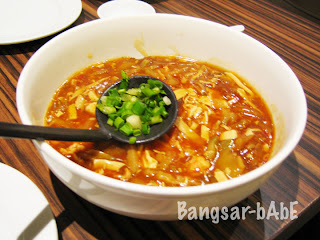 Smooth silky handmade noodles in spicy thick soup with chopped peanuts and garnished with spring onions. I added more chili oil to give it the extra zing. Even rif liked mine too. Jeen’s la mien came with four huge meat dumplings in clear broth. The broth itself was full of flavour and went well with the plain noodles. There was no need to add chili oil or any sort of flavouring to it. I didn’t get a pic of Tgin’s beef brisket la mien (RM 15) but it tasted alright. He had it non spicy but I think it would have tasted better spicy. 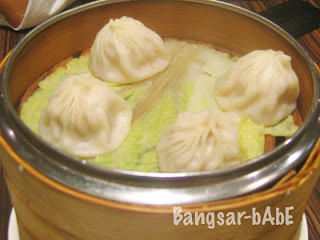 We had 2 baskets of Shanghainese Soup Dumpling. Served on top of cabbage leaves, the dumplings were tiny. I expected it to be really good since there was so much hype about it but I wasn’t blown away. It was actually not bad…but not until it warrants a hoo hah over. I would have preferred my soup hotter. This one was lukewarm but the well seasoned meat filling made up for that. We didn’t order any desserts as we someplace else in mind. 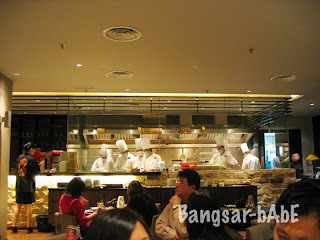 The bill came up to RM 85.10 after 10% tax and 5% service charge for the 4 of us. The chinese tea cost RM 2 per person and we did not use the towels provided so we got RM 4 waived from our bill. Verdict: Pretty decent food but slightly on the expensive side. i would like to say that my noodles is not “forgettable” it is NOT NICE at all..!! well at least it DOES NOT appeal to my taste buds as i understand that my noodles is suppose to taste like that and southern chinese people eat it that way..
Hmm, I quite enjoyed my experience! Have to say I still miss TAIPEI’s DIN TAI FUNG, the ORIGINAL, it just “doesn’t travel” well out of Taiwan, though Singapore’s DTF is a LOT better then the one in Gardens’ KL!